If you arrive in Bergamo by train, or by bus from the airport, you will immediately be greeted by a magnificent view of the Città Alta. 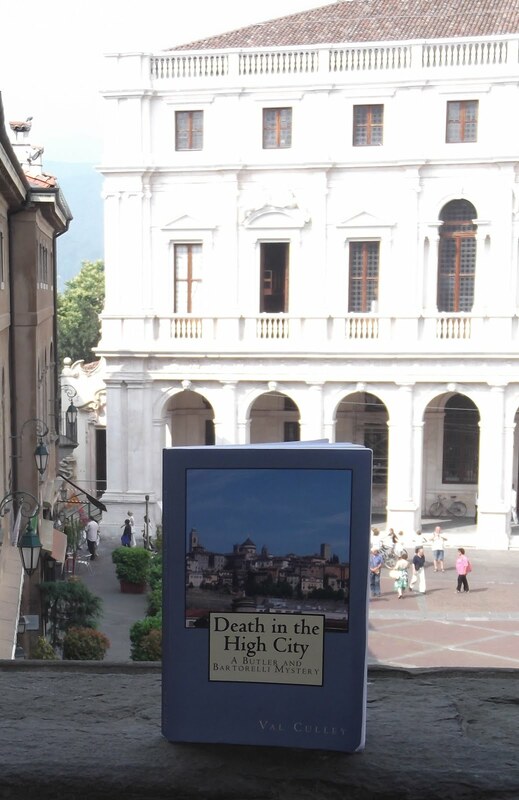 Stand outside the railway station and look down the long, straight Viale Papa Giovanni XXIII and you will see the towers and roofs of the Città Alta silhouetted against the sky. View in the skyline from outside the railway station. It’s a magical view and will make you want to go and explore the upper town at close quarters. The view is different according to the seasons. The Città Alta looks magnificent on a bright day against a blue sky, but it also looks beautiful shrouded in mist in the autumn. The Number 1 bus will take you directly there. Alternatively, you could choose to explore part of the Città Bassa on your way to the funicolare, the funicular railway that also transports visitors up to the Città Alta. Walk down Viale Papa Giovanni XXIII to Porta Nuova, a neoclassical gateway made in Bergamo’s medieval walls in the middle of the 19th century, which is flanked by i Propilei (the Propylaea), two buildings that look like temples. Further along Viale Papa Giovanni XXIII you will reach Via Sentierone. Turn to your right to see the 18th century Teatro Donizetti and next to it the monument to the composer Gaetano Donizetti, erected in 1897 in the centenary year of his birth. Opposite is Balzer, a bar founded in 1850 that has now become a Bergamo institution. Further along Via Sentierone is the church of San Bartolomeo, which has a large altarpiece by Renaissance artist Lorenzo Lotto depicting the Virgin Mary and child on a throne surrounded by saints. Retrace your steps along Via Sentierone and continue walking down the main thoroughfare, Viale Vittorio Emanuele II, until you reach the funicular railway station on the left hand side. Trains leave every few minutes from there for the short journey up to the Città Alta.